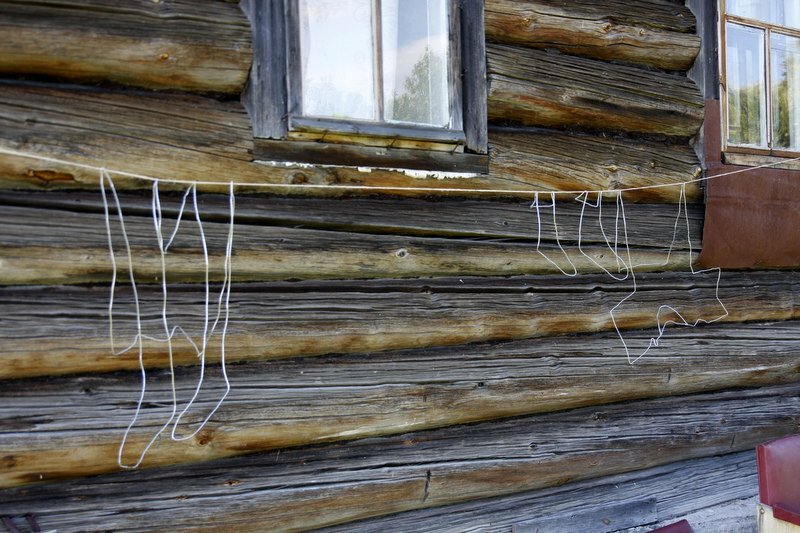 “At home, on a clothes line” Environmental art camp and exhibition, Tolstjakovo, Russia. The work talk about emptying out of rural areas and shows small signs of everyday life. In countryside homes lights are often left on even when people leave their homes for awhile. That is a sign of someone being at home, or that house is inhabited and not abandoned or empty. Just as the lights are, is laundry on clothes line a sign of inhabited house. To create “life” to the house, I made weather resistant laundry, on a clothes line. It all comes to time. We can never know time. We can not enjoy the true present, as it is an instant of zero duration. Mostly time moves slowly and increasingly and it is only noticed when we realized that something has changed. Even the change of the time is constant, it is always surprising that we feel surprised about that change.